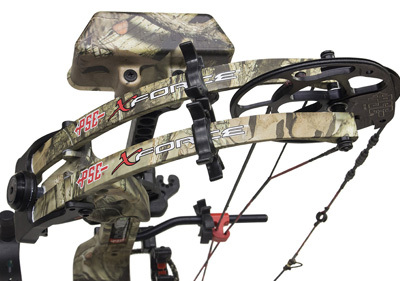 Help Article: What you need to know before ordering your new compound bow package. 1. RIGHT HAND OR LEFT HAND BOW? A right-handed person generally shoots a right-hand bow. A left-handed person generally shoots a left-hand bow. That's simple enough, but if you've never shot a bow before, you could easily misunderstand how bows are oriented for right and left hand. 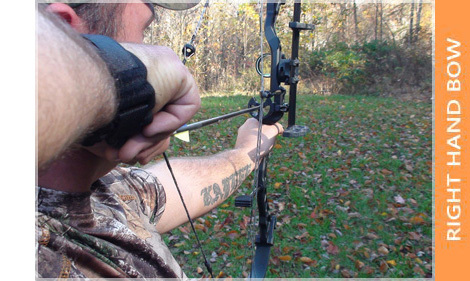 A right-hand bow is actually held in the LEFT hand and drawn back with the right hand. Conversely, a left-hand bow is held in the RIGHT hand and drawn back with the left hand. You choose the orientation of the bow based on the hand that draws the bow - not the hand that grips the bow. When you order your bow, you'll be asked to choose which weight range (limbs) you would like on your bow. Generally a bow's limbs come in 10 lb. increments. Some bows have more choices than others, but for a typical bow - you'll be asked to choose between 40-50#, 50-60#, or 60-70# limbs when ordering the bow. 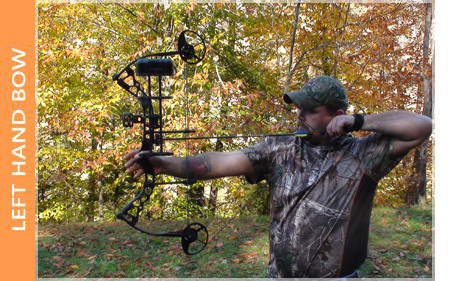 If you choose 50-60# limbs, for example, the bow can be adjusted for any draw weight within that 10# range (51#, 54#, 58#, etc.). However, it cannot be adjusted to say, 65#, or any other value outside of the 10# range. If you decide later that you want a draw weight that's higher or lower than the range you originally chose - your bow will need to have new limbs installed. 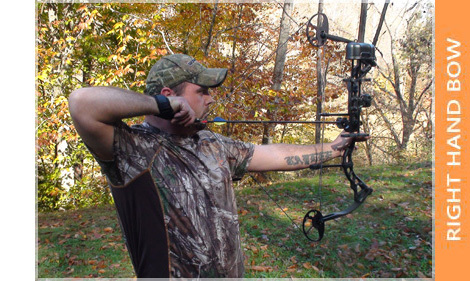 LIMB DESIGN: A bow's actual draw weight range is a function of many things (limb thickness, limb length, limb shape, limb preload, cam design, limb pocket design, hardware choices, etc.). But from a consumer standpoint, choosing a draw weight range is really just choosing a limb option. The bow companies do all the engineering to make this a neat A, B, or C choice. All you have to do is pick one. 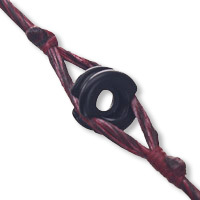 MAX TURNS ON THE LIMB BOLTS: Most bow manufacturers specify the maximum number of turns (revolutions) that the bow's limb bolts can be safely "backed-off" from the fully-tightened position. Pay attention to this important warning. 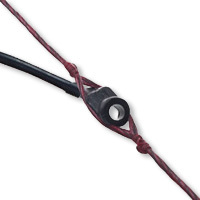 If you keep turning and turning a limb bolt too far, you will eventually run out of threads and disconnect the limb pocket from the bow (bow flies apart). So respect those mechanical limits. For quick reference, here are some general guidelines for choosing an appropriate draw weight based on body type. Of course, each individual is different. You should apply your common sense here and interpret this chart with due respect to your own age and general physical condition. We will gladly adjust your new compound bow to any draw length you specify (providing it is within the mechanical limits of the bow). If you already know your draw length, this is an easy one. If you need some help, here's a reliable measurement method we have utilized for fifteen years ... the trusty Armspan/2.5 method. To measure your draw length, determine the length of your arm-span in inches. Stand with your arms out and palms facing forward. Don't stretch when measuring. Just stand naturally. Have someone else help you, and measure from the tip of one middle finger to the other. Then simply divide that number by 2.5. The quotient is your approximate draw length (in inches) for your body size. If you are a person of average proportions, your arm-span will be roughly equal to your height (in inches). So there is often a direct correlation between a person's height and their draw length. But if you are particularly lankly, stocky, etc., the arm-span/2.5 method will probably yield the most reliable estimate. Even so, once you have computed your draw length using the method above, you can double-check yourself by using the scale below - to see if your numbers are in the ballpark. We don't use machine-fletched arrows - we custom build arrows to match each and every bow system we sell. Since we're going to be fletching your arrows by hand, YOU get to pick the fletching material. 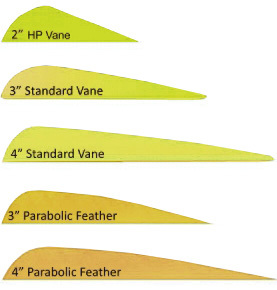 We offer you a choice of standard 3" or standard 4" plastic vanes, 2" high-profile vanes, 3" solid-color parabolic feathers, or 4" solid-color parabolic feathers. While this choice is entirely a personal preference, each type of fletching material has some advantages to consider. Plastic vanes are more durable than feathers. We strongly recommend vanes for youth-archers, as well as for others who tend to handle their equipment less delicately. Plastic vanes can be crumpled and abused (up to a point of course) and generally still pop back into shape. And since vanes can be fletched in a straight - offset - or helical configuration - they can be used with practically any style arrow rest. Vanes are the popular choice in our shop. However, for many archers - feathers offer some enticing advantages as well. Feathers are very light. Three 4" Gateway Feathers weigh about 9 grains - while 3 equal sized vanes weigh nearly 25 grains. The savings in weight means that your arrows are lighter and fly faster with flatter trajectory. The weight savings in the rear of the arrow also means better front-of-center balance on your arrows - especially for those who use lighter tips. Feathers are generally fletched in a helical configuration and offer excellent stability for broadheads. But of course, you have to be careful how you handle feathers. They are easily ruffled, ripped, and tattered with rough service. We offer vanes and feathers in a variety of standard colors (white, flo-yellow, flo-orange, flo-green, red, blue, green, and black). When you order your bow, please specify your choice or bright or dark colors. To request special colors, please leave a comment at check-out or call us at 877-410-7811 to order by phone. When you order your bow, you get to choose the fletching configuration, or "turn." This is the angle of the fletching along the long axis of the arrow shaft. The more angle you have, the more the arrow rotates in flight. If your fletching is arranged in a strong helical (spiral) pattern - like a boat propeller - your arrow will rotate dramatically. Straight fletch arrows rotate very little, and offset fletched arrows are in-between. As a general rule, an arrow will fly straighter and be more stable if it rotates in-flight. Aerodynamically, a helical configuration is clearly a better choice. However, a helical fletch may not always be appropriate or necessary for your particular bow setup. For example, some arrow rests will not provide enough clearance to allow a helical fletch to pass thru without contact. In this case, many archers use an offset fletch, where the vanes are still straight, rather than in a spiral pattern, but they are slightly turned on the shaft to promote some rotation in-flight without compromising fletching clearance. For very unforgiving arrow rests with limited clearance, or for competition target setups that don't require much stabilization, the straight fletch may be the best option. Take a look at the diagrams below and the corresponding pro's and con's associated with each fletching configuration. Note that feathers have a natural twist, so they must be fletched in a helical clamp, but 3" and 4" vanes can be fletched with any turn you like. You may choose to have your vanes fletched as a straight fletch, a 4º offset fletch, or a right-helical fletch. Each configuration has some notable advantages and disadvantages. If you are unsure, just choose "TECH SELECT" when you order the bow, and your technician will select an appropriate fletching configuration for you. 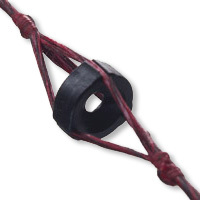 PEEP SIGHT TYPE: We use the three most popular peep styles on our pro shop bow packages. Choose from the Fletcher-style aluminum peep (two-way string split), the Trio-style peep (three-way string split), and the old standard Rubber-Tube peep (two way split, aligned by stretchy tube). Apart from these standard peeps, there are countless gimmick peeps out there: peeps shaped like hooks, peeps with lenses, peeps with glow lights or crosshairs, peeps that mount on some other part of the bow, peeps with little hoods, complicated miracle peep sights, etc. We don't sell them or install them in our bow packages; they cause far more trouble than they're worth. We stick with what works ... and here they are. FLETCHER: The small Fletcher-style aluminum peeps work beautifully and can provide the best and most-reliable sight picture, but you must train your string to keep them in proper alignment at full draw (a string-loop also helps). Experienced archers generally prefer Fletcher-style peeps, but they sometimes drive new shooters bananas because they turn with the string. The vast majority of our elite grade bows get equipped with a Fletcher-style peep. We strongly recommend this style peep, but we admit it requires a little patience when "training" a new bow string. TRIO: If tinkering with peep alignment sounds like something that might challenge your patience, we suggest you try the Trio String Peep. The Trio splits the string fibers into thirds, rather than halves. So even if your string rotates slightly, chances are you'll still have a clear field of view. It's still possible for one of the three strands to rotate into your line of sight, but it's a fairly easy problem to manage. The majority of our entry-level compound bows are outfitted with Trio-style peeps, and they are decidedly less problematic than Fletchers. However, even Trio-peeps can require a little tweaking from time to time. TUBE: Finally, the option with the best reliability is the old standard Tube Peep - and we will gladly install one if you request. They align every time. As you draw back, the stretchy rubber tubing pulls on the back of the peep sight and overcomes any string rotation. So at full draw the peep is always straight. Just be advised, the snapping sound of that rubber tube is tough to mute - and the tube costs you a little at the chronograph too. It's also worth noting that your rubber tubing won't last forever. It eventually dry-rots and breaks like a used rubber band. So from time to time it must be replaced. PEEP SIGHT INSTALLED HEIGHT: Standard peep sight height is 13 cm above the nocking point on the bowstring. This suits the majority of shooters just fine. However, you may elect to choose a HIGH PEEP (15 cm) to accommodate exceptionally long draw lengths or low anchor points. Youth bows and exceptionally short draw lengths will often require a slightly lower peep position. If this is your first bow or if you're not sure, we suggest you just stick with the standard 13 cm peep height. We serve all peep sights in place using a short-serve technique. This locks the peep sight in place so that it will not move under normal shooting conditions - while still allowing for some minor height adjustments without the need to re-serve the peep sight. Again, you can make changes to your peep height later if you wish. 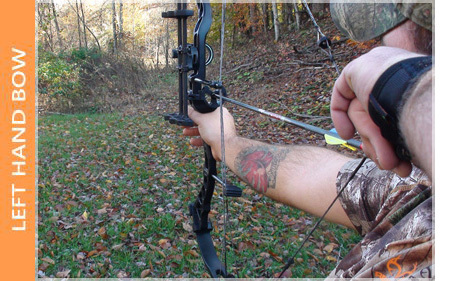 A red booklet entitled Getting Started with your New Compound Bow will be provided with your bow system. 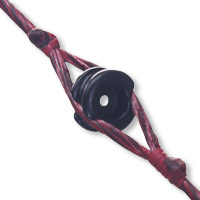 Simple instructions for adjusting your peep sight are included in the booklet. No more technical questions. We promise. Just pick the arrows and accessories you like best and you're ready to order. If you would like to talk this over with a real person, we invite you to connect with our experts first. Please don't hesitate to call us toll-free at 877-410-7811 (M-F: 8 AM - 7 PM ET). Archery is our favorite subject. We will be happy to help you make the best choices and go through your options one by one. We have a zero-pressure sales policy - no one will press you to make a purchase or try to hound you afterwards - we promise. If you're ordering a bow with non-standard options, special sizes, or if you would like to build your own package, please order by phone. You may also inquire about custom orders at our general inbox. International customers, please see instructions for placing orders from outside the U.S. and Canada.